On Tuesday Democratic presidential candidate Barack Obama linked his energy proposals to new manufac- turing jobs while speaking to B-W students, NE Ohio citizens and Ohio-elected officials including Sen. Sherrod Brown and Governor Ted Strickland. Obama presented his proposals for investment in renewable energy sources such as wind and solar power, as well as federal subsidies to American automakers for making environmentally-friendly cars. Obama touted the number of high-paying jobs that would be created by his plans and noted a possible tax credit to anyone who buys a high-tech car. 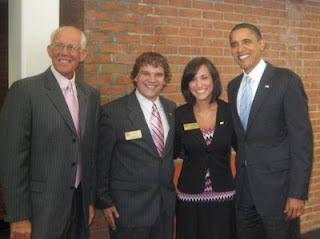 Before meeting with senior Ohio officials, Sen. Obama was greeted by future policy-makers from Baldwin-Wallace College, the president and vice president of the student body—Jamie Serenko and Ben Schaefer, respectively, as well as Baldwin-Wallace College President, Richard Durst. Obama held two town-hall style meetings, one in Austintown, near Youngstown, and in Berea.